Imperial folding knife versus a Camillus. I was wondering if anyone could tell me what the distinguishable characteristic was that determine that the pocket knife found on Niku was a Imperial knife? The Camillus as almost identical and the artifact found does resemble the Camillus. "EZ Open Jack w/ Bail"
Antique Camillus knife "EZ Open Jack w/ Bail". Antique jigged brown bone handle scales. High carbon steel spear point blade and pen blade. Both blades have good open, close, and half snap. Nickel silver bolsters, liners, handle pins, and bail. A great antique Camillus pocket knife that was proudly made in Camillus, New York U.S.A. between 1902 and 1945. Re: Imperial folding knife versus a Camillus. You have to get this message over to Ric ASAP. Ric and Pat are both pretty preoccupied just now. Ric catches up on the Forum at those times that are good for him. Meanwhile, I'll add a link to the Forum post to the wiki article. If anyone wants to acquire a reference knife and send it to TIGHAR Central, I imagine Ric and Pat would be very grateful. Richie, I'm getting that she gave Mr. LaGorce a knife from a previous flight - maybe her solo across the Atlantic. The Batavia knife which she identifies as a sheath knife seems to be more of a souvenir. So the jackknife from the Luke Field inventory Inventory item#24 is still in play as an object that could have made it to Niku. Subsequent posts to this thread eliminate the knife inventoried at Luke Field as a candidate for the knife parts found on Niku. Marty - I thought we had ID'd the jackknife in the Luke Inventory as being something other than an Imperial knife, but I see in the inventory that it is simply listed as "Bone Handle, double blade Jack Knife, large Blade No. 22309" Was there something about the Model / Serial number that led us to the manufacturer other than Imperial? The artifact matches the Imperial nicely, but this new Camillus option certainly looks like it needs to be examined closely to rule it in or or as a possibility. 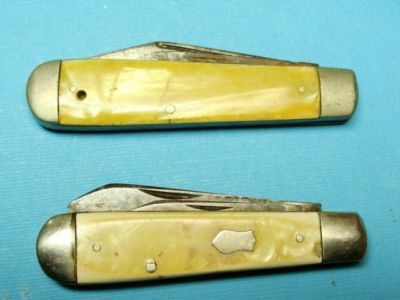 I think pocket knives generally were in ubiquitous use in those days, and many companies obviously made similar if not near identical products. There may be others that the Niku knife comes close to. Rick Jones suggested that "22309" matches the naming conventions of the Cattaraugus. See the wiki article for details and links. What is known about stencil brands as regard to pocket knifes of the period? Certainly not all who sold knives actually manufactured them but stenciled their brand on knives of other manufacturers. Here are images of a Cattaraugus 22309 that was for sale on eBay (same one?). You might want to snag the picture before it disappears. I am guessing that they do not come around very often. I had the impression that the artifact was identified as an "easy open" by the little half moon cut out that made opening the blade easier. I need to review. Thanks. Here is a collector page where they are posting all different brands that were of the "ez-open" type. If someone were to spend some time on this, overlaying the artifact on to the images, you might be able to isolate a few candidates. I don't want to borrow pictures without giving credit. We are talking about two different knives. The one that is identified as a Cattaraugus 22309 is the one listed in the Luke Field Inventory: "#24: Bone Handle, double blade Jack Knife, large Blade No. 22309." It is reasonable to think that this is a Cattaraugus knife because the number matches the Cattaraugus Knife Numbering System. No one has said that the knife parts found at the Seven site are from a Cattaraugus 22309. Quite the contrary. The link just given says: "Bone handled, double-bladed 'Easy Open Jack Knife' manufactured by The Imperial Cutlery Company. This knife was widely available commercially from 1930 onward and, during WWII, was also produced in large numbers under U.S. government contract as 'bone handle Navy general utility pocket knives' and 'Navy easy-openers.'" I just wanted to be sure that no one was thinking that the knife found was the one from the Luke Field inventory. I should have worded that more carefully. also makes it a candidate for a relic of the LORAN coasties. Could be two different knives, notice brass bolsters, not same as easy open! This knife is a Kutmaster Imperial jack knife. Looks more like the broken knife in your picture, I could be wrong of coarse, but looks exactly the same to me!